Public Image Ltd frontman John Lydon will be interviewed in the EVR booth this morning, May 18 at 10AM EST on a special edition of Pizza Party. 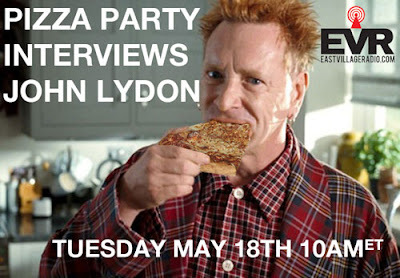 The ever outspoken Lydon is sure to be entertaining. PiL have a couple of shows in NY this week. They'll be at Terminal 5 on Tuesday, May 18 and the following night, they'll be at Music Hall of Williamsburg, Wednesday, May 19.